2x Local Windows PC’s (virtual or physical) newly installed and patched. 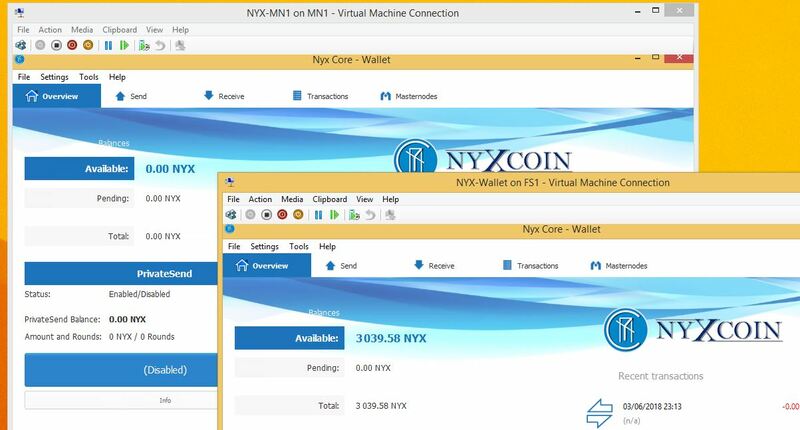 Latest NYX client installed and fully sync with the block chain. The first thing we need to do is send our stake amount of 1,000 NYX to a new address that will be our node address. It has to be exactly 1,000 coins not more, not less. We now need to send 1,000 NYX to this new address. Close the debug window for now and navigate to the Send TAB. Send the NYX coin to the new address you have just created by pasting the new address in the “pay to” field. The label field should auto populate with the name you gave the address confirming the address you are about to send to is correct. You will see a pop up message saying that you have sent 1,000 NYX to Yourself, wow that was scary!!! Back on the dash board you should see the same balance minus a small transaction fee, check the Transaction tab and wait for at least 20 confirmations before continuing. I normaly like to wait for more than 20, we are in no rush. Now we have confirmed our 1,000 NYX coins are in the new address and we have had over 20 confirmations we can now move on. you need to find the following 2 files and edit as follows. Locations on other Windows versions may very but essentially in the same place in the profile. They also maybe in a custom location if you selected that during wallet install. Now that the configuration files are setup we can reboot both Nodes and confirm they both auto start. If not check the auto start settings under options tab. The fact that the status is “MISSING” is OK at this stage. 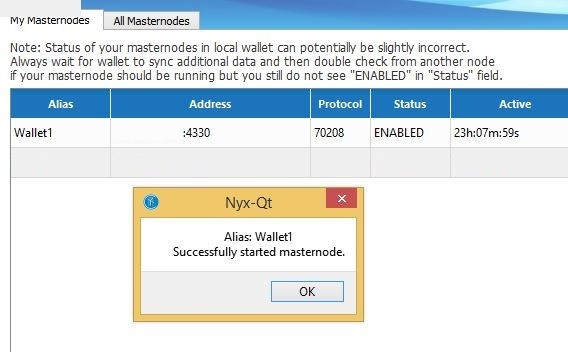 On the HOT wallet goto the console tab and run “masternode status” You should see something like this. This is also normal and we need to wait for 20-30 Mins for the node to register on the Masternode list. After anything from 5 to 30 Mins your Node should show the status as Enabled. 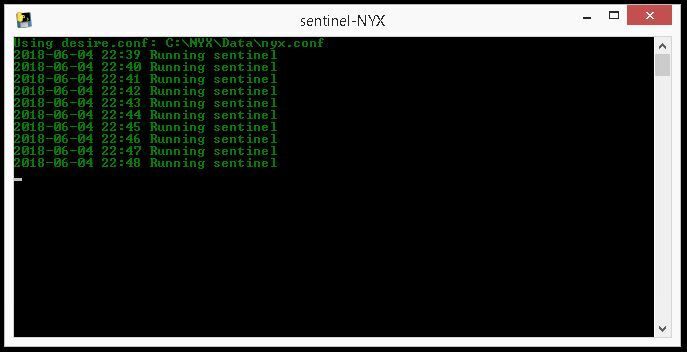 If you find your node constantly losing connection and goes offline with a WATCHDOG_EXPIRED Status then you will need to run Sentinel. This can be downloaded from various source like the NYX Github for example. Place the EXE file in the directory as your NYX EXE files and create a short cut on the desktop to it. Edit the Target string to look like this.